Jazz is a fictional robot superhero character from the Transformers robot superhero franchise. He is usually portrayed as a music-loving robot and speaks in slang. He is also Optimus Prime's good friend and right-hand man. Jazz (Tigre in Italy) is the "very cool, very stylish, very competent" member of the Autobots in the Transformers television and comic series based on the popular toy line produced by Takara and Hasbro. His original vehicle mode is a Martini Porsche 935 turbo racing car. Self-possessed, calm, and utterly collected, Jazz is Prime's subordinate and first lieutenant of the Autobots, as well as head of Special Operations, with his own dedicated roster of agents. He often gives the most dangerous assignments to himself. It is not a matter of ego—he just really is the coolest head for the toughest missions. Jazz's ease extends to whatever environment he finds himself in, no matter how weird or wonderful. He effortlessly tunes into the local culture, assimilating and improvising, and making creative command decisions, making him an indispensable right-hand bot to Optimus Prime. In the episode "Starscream's Brigade", Jazz with Cliffjumper were guests of honor for an unveiling of a statue honoring their leader and friend Optimus Prime. But Starscream, after being exiled from the Decepticons, ruined the event with his newly created army the Combaticons. Before they could call for backup they were capture by Starscream and the Combaticons, an attempt to strip them of their energy observers for the Combaticons. Jazz and Cliffjumper were then chained up at a hydroelectric power plant and then were rescued by the other Autobots when they arrived at their location. Towards the end of 1985, Jazz was among the team of five Autobots who disguised themselves as the Stunticons in "Masquerade". (Jazz, a Porsche 935 turbo, was made to resemble Dead End, the Stunticon Porsche 928.) Penetrating the Decepticons' camp, the Autobots ran into trouble when the real Stunticon team arrived; trying to prove their identities by forming Menasor. With a combination of Windcharger's magnetic powers and Mirage's illusion-creating ability, the Autobots were able to appear as Menasor as well. Though the deception was soon revealed, they were still able to thwart the Decepticons' plans. Shortly after the film's release, Jazz's voice actor, Scatman Crothers, died. The movie release was the last time that Jazz spoke. However, Jazz made minor cameos throughout the third season of the TV series in the episodes "Five Faces of Darkness" where he competed in a race and won, and fought alongside Perceptor and Rodimus Prime. 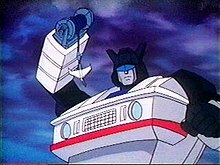 In the episode "Dark Awakening", he briefly stood beside the reincarnated Optimus Prime and in the episode "Call of the Primitives", he was seen for the final time. It is assumed that Jazz was left to patrol Cybertron and was around to witness its new golden age. After the animated series ended in the U.S., Jazz appeared in animated form in the commercials for the Classic Pretenders, Action Masters, and Hot Rod Patrol. In the Japanese series, Headmasters ( the official fourth season of the Transformers in Japan), Jazz reappeared with a certain regularity in the first episodes, acting as right hand of Optimus Prime until the latter's death. In episode 4, he was operating inside Metroplex alongside Ultra Magnus, and after Trypticon and Mad Machine defeated Metroplex, he received the task to repair the computer of the Autobot mobile base. Jazz was featured in the 1985 Find Your Fate Junior book called Vanishing Drive by Barbara Siegel and Scott Siegel. In a story called "By their Blasters you shall know them ...!" from Transformers Comic-Magazine issue #12 by German comic publisher Condor Verlag Optimus Prime instructs Backstreet, Bumblebee and Ruckus on how to identify Autobots from Decepticons in battle using the Ark's computer. Pretender Jazz is one of those he displays to the Autobots. In this reimagining of the Generation One story, the Ark was discovered by the terrorist Cobra Organization, and all the Transformers inside were reformatted into Cobra vehicles remotely controlled by the Televipers. In this storyline Jazz turned into a Cobra S.T.U.N.. In the sequel, he ended up being warped to the 1970s, where he was automatically reformatted into a pimpmobile. Jazz, Sideswipe and Sunstreaker were repaired by the Earth Defense Command. In return, Jazz commanded Sunstreaker, Sideswipe and Bumper in investigating the Insecticons for the Earth Defense Command. Eventually they rejoined Windcharger and Wheeljack, and all rejoined Ratchet on board the Autobot ship Orion (Transformers: Generation One vol. III #9). In Battle Lines Jazz was present as Optimus Prime was appointed the new commander of the Autobots. Jazz is among the Autobots present when Megatron attacks Iacon with his new weapon, Devastator. Jazz appears in the story Generation 2: Redux where he is among the reinforcements from Autobot City to respond to the Decepticon attack at the Large Hadron Collider in Switzerland. Once there the Autobots are able to defeat the Decepticons, but during the fight the Autobots are exposed to refined Forestonite, which enhances and mutates Cybertronian systems. He gets enhanced to his Generation 2 form. In Invasion Jazz is among the Autobots at the Autobot Ironworks base who is wounded in battle with Shattered Glass Ultra Magnus. Jazz appeared in issue #2 of Megatron Origin. In this story, set on ancient Cybertron he was a member of an Autobot security force in the city of Kaon. His squad was hunting the operators of gladiatorial contests in the degenerate slums, particularly Megatron. In IDW Publishing's The Transformers: Infiltration mini-series, Jazz is part of an infiltration unit consisting of Ratchet, Ironhide, Wheeljack, Bumblebee and Sunstreaker, led by Prowl. He has not played a major role thus far, other than to accompany the other Autobots to the Decepticon base to watch the duel between Megatron and a super-powered Starscream, saving Bumblebee from Runabout at one point. In the follow-up series, The Transformers: Escalation, after the supposed demise of Sunstreaker, Jazz and Wheeljack tracked down his body—only to be temporarily disabled by the advanced weaponry of the Machination (although Jazz' pride took more of a dent). Since then he has accompanied Optimus Prime to Brasnya to track down Megatron and his human facsimile—only to wind up in battle with Skywarp and Astrotrain. He and Wheeljack managed to put Skywarp to flight, but he promised to return with reinforcements. They then confronted Megatron (who had nearly killed Optimus Prime). On Prime's orders, they focused fire on Megatron long enough for Prime to recover and drive off the Decepticon leader, although they were prevented from dealing a killing blow by the appearance of Skywarp and Thundercracker. Bumblebee, Jazz, Optimus Prime, Prowl and Ratchet are in the miniseries New Avengers/Transformers crossover by Marvel Comics and IDW Publishing from 2007. Jazz would appear in the U.K. Marvel comic issue #234, "Prime's Rib!" This story is set in the near future, 1995, where Optimus Prime, Jazz and Hot Rod introduce the latest Autobot, Arcee, to the human feminists. She was met with displeasure by the humans, being called a token female and disliked for her pink color. They were then attacked by Shockwave, Fangry, Horri-Bull and Squeezeplay, who thought the Autobots would be unveiling a new weapon. The Autobots fought off the Decepticons, who escaped, but nothing seemed to please the human feminists. According to original tech spec notes written by Bob Budiansky found at Iacon One in 2006, the original name for Jazz was Jazzz. Original script scans from the DVD box sets show that the writing staff also used the name Jazzz. The name Jazzz also appears in early Transformers coloring books. The 1984 version of Jazz was re-issued in Europe in the early 1990s and Japan in 2001. A special variant of Jazz was given away as a promotional item from Cookie Crisp cereal in 1985. This version of Jazz is nearly the same as the one sold in stores, except it came in a brown cardboard box and the stickers had the words Martini (misspelled as Martinii to avoid paying out royalties) and Porsche removed from them. A promotional pack in item. A Kmart store exclusive of Jazz, essentially his Pretender car without the shell and its accessories. Jazz was one of the Autobot cars to be released on Generation 2, with a slight repaint and weapons change. Jazz appeared in his Generation 2 form in the short lived UK Generation 2 comic series. This series also printed a bio for Jazz where he had the new motto "Decepticons keep bad company—each other!" Jazz was also to be released as a Laser Cycle, repainted from Road Rocket, but the figure was never released. A few prototypes of the toy in package were made, and have sold for over $1300 in auction. A special "Electrum" version, covered in gold chrome-plating, was also released in 2001, commemorating the cartoon episode "The Golden Lagoon" (in which the Transformers coat themselves with a metallic gold substance and become temporarily impervious to their various weapons). Meister came in flap window "Collection Series" style box. Collection 01 Meister along with 02 Prowl were debut sets for the new T/F Collection line, and started the whole reissues. The mouth is different from the original. Included silver gun and missiles. The toy was reissued as Autobot Jazz by Hasbro in April 2003. Hasbro followed Takara package design change and released Jazz in flap window box. He was renamed Autobot Jazz (due to copyright) and several modifications were made to keep the toy conformed to US safety standards such as elongated missiles and launcher, plus the used of flexible black plastic for gun and missiles. A miniature version of Meister/Jazz. His function is Special Operations Expert. Clever, cool, and adaptable, Autobot Jazz takes on the riskiest missions with trademark flair, dazzling enemies with spectacular sound and light displays. His vast knowledge of Earth culture makes his especially valuable in Earth operations. Equipped with photon rifle, flame-thrower, full-spectrum beacon and 180db stereo speakers. Jazz (Meister in Japan) was released as a Binaltech/Alternators toy in 2004, with the new alternative form of a Mazda RX-8. He was released in both white and red colors, with fans referring to the red version as Zoom-Zoom (A reference to the jingle used in Mazda commercials). Binaltech Meister was released again in 2008 with a Transformers 2007 movie Jazz silver paint color and slight mold tweaks that were found on the Binaltech BT-13 Laserwave. This new release is called Argent Meister. Initially released in small numbers in 2004, Jazz was re-released in 2006 in new packaging. Due to trademarking, Jazz toys are generally prefixed with the word "Autobot", to reinforce Hasbro's rights to the name in the "Toys and Sporting Goods" trademark category. However, Aaron Archer has stated that since Hasbro had already used the "Autobot" prefix for the two previous Alternators figures, "Autobot Hound" and "Autobot Tracks", they instead elected to use the Japanese name rather than repeat the same pattern with "Autobot Jazz". Additionally, there was still some optimism that Porsche might change their mind and grant them the license to do an actual "Jazz" as a Porsche. As an inside joke, when Hasbro was describing their new Meister toy on their web site they stated "Incredible detail and 1:24 scale jazzes up the action!" Alternators Meister was voted the 75th top toy released in the last 10 years by Toyfare Magazine. A small figure based on the animated series appearance of Generation 1 Jazz. Released by Takara Tomy in Japan in 2008, the original G1 Jazz was released with a new face mold. Also, some of the original stickers were applied by the factory to give the figure a clean look where fans sometimes applied the stickers off-center. The Q Transformers toy line by Takara Tomy has Jazz transforming from a Toyota Sprinter Trueno AE86. This line displays the Transformers as a "cuter" version of themselves. Jazz appears in the 2007 Transformers live-action film directed by Michael Bay. When the movie producers unveiled the final list of Transformers characters appearing in the movie, Jazz was described as having a love of style, with a hip-hop personality. Jazz is a trickster who manipulates everyone including the Decepticon leader. Jazz first appears in the film arriving to Earth in his Protoform state, and searches for a suitable alternate mode to proceed unnoticed. Afterwards, using a fluid capoeira inspired style, he can be seen transforming using a windmill dance move in his first scene and dialogue, Optimus Prime describes him as his first lieutenant, as he was in the G1 animated series. Along with Optimus Prime, Jazz is the Autobot who retains most of his original Generation 1 design in the film, among his iconic features, his trademark "visor", which is retractable in the movie, as well as front-chassis chest and wheel wells in his feet. 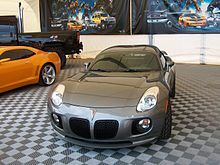 Also, his transformation to vehicle mode, although in the film his alternate mode is not a Porsche 935, a similar looking model was chosen, as Jazz's alternate mode in the film is a silver/gray customized hardtop Pontiac Solstice GXP, similar to the weekend racer concept car. Jazz is armed with a crescent blaster. He also possesses a type of electro-magnet in his right arm, which he uses to disarm humans of their guns without causing them injury, curiously leaving jewellery and electronics unaffected. In the final battle, when Bumblebee is unable to fight, Jazz provides cover despite being outnumbered three to one. He fights Devastator (Brawl) alongside Ironhide and Ratchet, and then takes on the Decepticon leader, Megatron. He orders Ironhide and Ratchet to fall back, deciding to stand his ground in order to protect the humans running away. Despite Jazz's efforts to injure him, Megatron drags Jazz onto the tower and rips him in two, killing him. After the battle, Ironhide and Ratchet find Jazz’s remains lying on the ground, and Optimus halfheartedly eulogises him before moving on. "Cybertron is cool, but Earth rules." In December 2007, drawings were leaked on the internet of Jazz's robot appearance in the Transformers Animated television series, debuting on "The Elite Guard". Jazz is a trained Cybertronian ninja, and wields a pair of Nunchaku in battle. He is more advanced than Prowl, though he is still impressed by Prowl's competency. His overall personality reflects that of his Generation 1 incarnation and he's quite open-minded when it concerns humans and their culture. In his own words, "Any species that can come up with a sweet ride like this, can't be all bad." Jazz is the second-in-command of a Cybertron Elite Guard team under Sentinel Prime. He comes to Earth alongside Ultra Magnus and Sentinel Prime, being the first of them to find out that humans aren't as contagious as he thought when he encountered Sari Sumdac before helping Prowl against the malfunctioning police drones. Later, while investigating an Allspark fragment on a train, Jazz and the other Elite Guard members were unaware that it was actually a trap set by Starscream meant for Megatron. Unfortunately, both Jazz and Ultra Magnus both get blasted back by the fragment. When they catch up to Optimus and his team, both the Elite Guard, Optimus, and the rest of the team immediately battle Starscream and managed to capture him. He has an incredibly minor appearance in "A Fistful of Energon" alongside the rest of his team when Starscream breaks out of the ship. In the season 3 episode "Transwarped" he appears again with Ultra Magnus and Sentinel Prime in their ship. He is shown receiving call from Rodimus Prime about a Decepticon attack. He manage to escape the attack along with his team. He and Sentinel Prime are ordered Ultra Magnus to Earth with an Elite Guard unit to track down Wasp with the group's new members Jetfire and Jetstorm. Unlike Sentinel Prime who hates being back on Earth, he enjoys the fact that rain can clean their armor plates while explaining that the new Elite Guard members to Optimus and Ratchet after a misunderstanding. When Bumblebee and Wasp face off in a video game to prove which is the real Bumblebee, he explaines to Jetfire and Jetstorm that humans can make a lot of interesting things. He later helps Prowl during the events of "Five Servos of Doom" in uncovering how Sentinel is "capturing" high level Decepticons with seemingly no help. He remained on Earth until the end of "Predacon Rising", saying his goodbyes as he joins the Elite Guard in taking their prisoners to Cybertron. During the trip back to Cybertron, Jazz is one of the first to suspect that Sentinel Prime is putting his own personal ambitions ahead of whats best for the Autobots, particularly when Sentinel suddenly demands that Jazz refer to him as "Sir" or "Commander". Jazz is much more receptive to Optimus Prime's command style such as when he and Jazz use secret code to prep a trap for the Decepticons. He appears again in "This is Why I Hate Machines", secretly helping Ratchet and Captain Fanzone while they were on Cybertron. After they left with Ultra Magus' hammer, Jazz uses a pursuit of them as an excuse to leave the Elite Guard and become a member of Optimus' group. By the time of "Endgame Part 1", Jazz is assisting Prowl in completing his Cyber-Ninja training and mastering the ability of 'Processor over Matter.' In part two and the series finale, he and Prowl at first battled the Omega Supreme clones, and then decided to piece together the fragments of the AllSpark to save Detroit from a self-detonating Omega. When it appears no more fragments are available, Prowl sacrifices his Spark to save Detroit, much to Jazz's horror. He later brought Prowl's body to Optimus Prime, and returned to Cybertron with the group, the captured Megatron, and Prowl's body. The basic to-scale transforming figure. Transforms from sports car to robot and carries two gray Nunchaku. The mold for this figure is also used for the BotCon 2011 exclusive Deluxe Dead End. A simple children's toy of Jazz that pulls back and pops up upon hitting an object. A silver redeco of the Bumper Battlers toy. First mentioned on a Walmart computer listing in July 2008. Despite seeing a limited release on Australia, further release of the toy worldwide was canceled. A redeco of the original Deluxe figure with a new deco of silver and gold, resembling the colors of the 2007 film version. The Japan release version by Takara Tomy is virtually identical to the Hasbro version, with the exception of metallic silver front bumper, side mirrors and Nunchaku holders. Released on July 2010. This Jazz is an evil mirror-universe version of the Generation 1 character According to his tech specs, Jazz and his brother Ricochet serve as Optimus Prime's powerful and merciless bodyguards. He and his brother were created in an experiment by Optimus Prime. Jazz's speech mannerisms ("I pity the tool that thinks he can force me to climb a tower.") are based upon those of Mr. T. He seems to dislike heights, a possible reference to Mr. T's character on the A-Team series. In "Do Over" Jazz reportes that the launch of the Ark will happen on time to Optimus Prime, but then lets it slip that his brother Ricochet has captured Megatron, leading to Optimus Prime rushing off to destroy his adversary personally just before the Ark launch. A BotCon '08 exclusive white redeco of Cybertron Crosswise and Smokescreen with a new head that resembles his G1 counterpart. Much like the original Jazz toy, his car mode is decorated with Martini Racing-style livery, with the addition of labels that read "Massacre Racing" and "Kill to Win". This figure is 13 centimeters long in vehicle mode, whereas a real Bugatti Veyron is 447 centimeters long, so the toy is at a scale of about 1:34. The toy stands about 14 centimeters tall in robot mode, which means Jazz would stand about 481 centimeters (15 feet 10 inches) tall. The mold of this figure was also used for Jazz's partner Ricochet, which was given as a freebie to pre-registered guests at BotCon '08. Jazz started out as a friend to Orion Pax, before Orion became Optimus Prime. Appears in Transformers: Exodus, Transformers: Exiles and Transformers: Retribution. Jazz was Orion Pax's friend before the war for Cybertron began, and served as a messenger under the caste system. He and Orion discussed Megatron, with Jazz offering his friend advice and later serving as a sparring partner. After Orion was named Optimus Prime, Jazz became his second-in-command throughout fighting on Cybertron and after the Ark left the planet. Jazz was known for his sarcastic sense of humor and his tendency to informally address Optimus as "OP." Jazz appears as an arena boss in the Transformers: War For Cybertron - Autobots video game for the Nintendo DS. On the console versions of the game, Jazz makes a few appearances in the campaign level "Kaon Prison Break". Jazz appears in Transformers: Fall of Cybertron and his campaign mission sends him hurtling into danger. He forms a buddy bond with the Autobot stealthy assassin Cliffjumper. He has a grappling hook that shoots a beam of energy and clings to a surface, speeding the Autobot warrior to the other side. At first Jazz and Cliffjumper fly to the Sea of Rust, with Sideswipe, to find Grimlock, but, stumble on to something big. Jazz finds Shockwave talking to Starscream about a building he found in the Sea of Rust. Cliffjumper then tries to kill Shockwave, but fails, then Shockwave calls in insecticons to kill Jazz, while Cliffjumper trying to activate a meltdown. Then the both escape and are saved by Sideswipe. Later on in the game, in the Ark Jazz comes to the rescue to defeat Bruticus. With the help of Jetfire, Jazz manages to defeat Bruticus. Jazz appears in Transformers: Robots in Disguise, voiced by Arif S. Kinchen. In the episode "Can You Dig It? ", Jazz is sent to Earth by the Autobot High Council to investigate Fixit's distress call after the Alchemor crash-landed on Earth. He assists Bumblebee and his team in apprehending the Decepticon Ped, being partnered with Sideswipe for most of the episode; Sideswipe soon viewing Jazz as a mentor figure. After Ped was apprehended, Jazz left to smooth things over with the council over Bumblebee's team being on Earth, promising Sideswipe that he would return. A new mold of Jazz, includes a blaster and transforms into a Cybertronian car. Jazz is an Autobot aligned Kre-O and Kreon. Bam! It's AUTOBOT JAZZ here and I'm just aching for some downright magnificent DECEPTICON beat-downs. But, OPTIMUS PRIME told me in that big serious voice of his, "Restraint in battle is a virtue we must maintain." Blah, blah, blah, I want to get out there and kick some DECEPTICON tail pipe! Favorite Pastime: Visiting the KREON bloxing clubs to catch a fight with my crew. Favorite Song: "Nothin' But A Bot Thing"
Kreon Jazz appeared in the animated short "Last Bot Standing", where he attended a tag-team wrestling match. Kreon Jazz appeared in the animated short "Bot Stars", where he attended a robot dance competition. Kreon Jazz appeared in the animated short "The Big Race", where he was among the Autobots waiting at the finish line as a race. A Lego-like building block kit of Jazz with 122 pieces to assemble in either race car or robot mode. Comes with 2-inch Kreon figures of G1 Jazz and a human driver. ^ a b Bellemo, Mark (2007). Transformers Identification and Price Guide. Krause Publications. p. 19. ISBN 978-0-89689-445-7. ^ "Find Your Fate Junior - The Transformers". Gamebooks.org. Retrieved 2010-04-27. ^ Bellomo, Mark (2010). Totally Tubular '80s. Krause Publications. p. 115. ISBN 1-4402-1282-1. ^ Brereton, Erin (2006). Transformers: The Fantasy, The Fun, The Future. Triumph Books. p. 22. ISBN 1-57243-983-1. ^ "IDW Publishing First Looks". Comics Continuum. 2009-03-12. Retrieved 2010-04-27. ^ "TRANSFORMERS Movie Legend: AllSpark Battles - AUTOBOT JAZZ vs. BONECRUSHER - Product Detail". Hasbrotoyshop.com. Retrieved 2010-04-27. ^ "Transformers Allspark Battles: Battle Jazz Vs. Ice Megatron - Product Detail". Hasbrotoyshop.com. Retrieved 2010-04-27. Wikimedia Commons has media related to Jazz (Transformers).